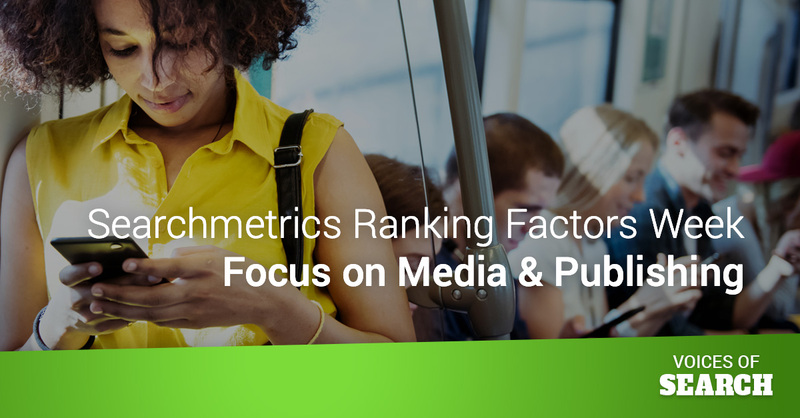 When it comes to media and publishing, how do you ensure successful rankings on Google? In this third podcast of our April Searchmetrics Content Ranking Factors series, renowned SEO strategist Jordan Koene, CEO of Searchmetrics, explains the specific ranking factors used for media and publishing sites, with the steps marketers can take to ensure better visibility. What are the ins and outs of how Google is prioritizing breaking news? Why have ESPN and other sports news companies transitioned their sports desk, where posting scores has become a very automated process? How are the use of images and video in news and media impacting rankings? How to effectively use the AMP technology stack so that it’s integrated into your site? Ben: Welcome back to industry ranking factors week on the Voices of Search podcast. I’m your host Benjamin Shapiro and this week we’re going to publish an episode every day covering what you need to know about the ranking factors that impact search visibility in your industry. Joining us for industry ranking factors week is Jordan Koene, who is a world renowned SEO strategist and the CEO of Search Metrics Inc. And today we’re going to continue industry ranking factors week by talking about the ranking factors impacting visibility in the media and publishing industries. Ben: But before we get started, I want to remind you that this podcast is brought to you by the marketing team at Search Metrics. We are an SEO and content marketing platform that helps enterprise scale businesses monitor their online presence and make data driven decisions. And as part of ranking factors week, we would like to welcome you, our loyal podcast audience, to our upcoming webinar, where we’ll discuss the evolution of custom ranking factors with machine learning on April 25th. Join our discussion about how the new generation of machine learning driven technology is evolving to provide on demand and domain specific ranking factors that are shaping the future of SEO. Ben: To register for our custom ranking factors webinar, go to searchmetrics.com/webinar. Okay, here’s the second installment of ranking factors week with Jordan Koene, Search Metric’s CEO and lead SEO strategist. Jordan, welcome back to the Voices of Search podcast. Jordan: Hey man. Yeah, this is it’s going to be a fun week. I think people are going to really really get a lot of takeaways and start to unpack what’s going on in these different industries. Ben: Absolutely. I’m excited to continue the conversation about industry ranking factors. And yesterday, we talked a little bit about Ecommerce and how there’s really only one priority ranking factor that’s industry specific, which is you got to differentiate based on content. Today, we’re going to talk about the media and publishing industry, which I think has a little bit more variability. So, I’m guessing that we’re going to run into more ranking factors than just one. Let’s start off by just you tell me how you think about the media and publishing industry, and what do you look at to evaluate the success of a site and its visibility. Jordan: So, media and publishing is another unique industry where Google has created various SERP experiences that are very native to that to that category. The most notable and the most common being AMP and AMP integration within the news and news feeds that show up on the SERP. So obviously, when Google identifies or classifies a keyword to be media related or news related Google is going to enforce that experience within the SERP, and that’s going to consume a fair amount of real estate within the SERP. Ben: So, for the newer SEOs that are listening, just give us a 32 second summary on what the AMP platform is. Jordan: Sure. So AMP is a technology stack that can be integrated into your site and allows Google to cache your content. And then it essentially allows it to serve and render faster. By enabling AMP and using AMP, in particular, in the news and media category, it really does allow you to become more exposed within the SERP because, especially within this medi it’s very critical to allow users to quickly access your content and do so in a very structured form because that’s what AMP really does is it forces you to use a very structured form in order for Google to cache and consistently load this content fast. Ben: Right. So, essentially, Google is trying to standardize the content in the news and media platform in terms of the page structure to optimize it for speed for load time. Why is that so important? Why does speed matter more in media and publishing, and why is Google trying to standardize this industry specifically as opposed to Ecommerce or any of the other industries that we’re going to talk about? Jordan: Well, quite frankly news in particular is an on-demand service and the faster you are able to publish and release that information, the better off your viewers and and readers are going to be. There’s a reason why companies like ESPN, and other sports news related entities have really transitioned their sports desk, especially when they’re showing scores and a score summary to a very automated process. So, what you’ll notice is like a lot of the baseball scores in the summary of a of a baseball game is very much automated. It is not John Smith, the sports writer for the San Francisco Giants who sat down and wrote, wrote the summary for that, that … those days are long gone. Ben: It’s a very automated process because time is of the essence and the moment that game is over, if you can publish the score and a summary of that score, your viewers are going to hit that page and be able to quickly consume what happened in that ballgame. Ben: It’s interesting that Google is essentially prioritizing breaking news. My guess was that you were going to say that the content of the pages don’t change very often in news and publishing, the lifespan of the average news article is 24 to 36 hours, and so they just want to standardize the pages because people are cranking them out so fast. And I guess I’m wrong, you’re saying it’s really about just getting those pages up and ready as quickly as possible. Jordan: Absolutely. And, one of the crazy statistics that we have in our ranking factors for media that I think is really unique, and one of the major leading predictors of success in this category is the use of supporting content in the sense of like images and video, what we actually notice here is that there’s a significantly less images and video, news and media, it doesn’t mean that they don’t exist at all, that’s a falsehood, but it’s that they’re just use less frequently and at a smaller volume because speed and access to the content is what really matters in this category. Ben: Got to me, media and publishing is, is so counterintuitive, I would have assumed that media and publishing is really rich with multiple formats of content, like lots of video, lots of images, and you’re just saying, look, it’s about getting texts to people as fast as possible. Jordan: Exactly, exactly. And in various forms, there is a slight winner takes all type mentality in this category. So, the faster, the more accessible, the better off and better structured your feeds are when it comes to your content, you can control the real estate within the news and media category. Now again, we’re very much talking about a very specific subset here in the news and media category, which is more than newsworthy type content, but we shouldn’t forget that there are a lot of publishers in this space as well who are creating more long form articles, and long form content, and investigative type content, and in some cases, these rules may or may not apply for you and it’s just important to take note that there are very different subcultures in this category. Ben: So, let’s talk a little bit more about the non-breaking news, non-broadcast type content for people that are working on longer form more evergreen publishing, what are the ranking factors that they need to be aware of? Jordan: So, one of the interesting data points that we see in this category is the use of Knowledge Graph. And historically, a lot of people just associated Knowledge Graph to Wikipedia. And yes, it’s true, Wikipedia still shows up pretty frequently in the Knowledge Graph, but that is changing at a rapid pace. It is incredible how fast Google is now introducing multiple links within the Knowledge Graph, they’re introducing multiple sources in the knowledge graph, creating specific hyperlinks within the actual Knowledge Graph experience that allow you to sub-select a data point. These improvements or evolutions of the Knowledge Graph are really critical for all these long form publishers to understand because if you are writing something that is going to be groundbreaking, or very, very connected to say a person, a place, an event, it is really important for you to build your content in a way that can become so authoritative the Google want to feature it in the Knowledge Graph. Jordan: And that I think, is one of the unique things because what we see in the data is that nearly 80% of media related keywords will have a Knowledge Graph in it. So your ability to control that real estate, whether it’s eyeballs only or traffic, is super critical. Ben: So, the ranking factor here, for the publishing side of the media and publishing industry, is that you want to be in the Knowledge Graph, but what’s the way to get into the Knowledge Graph other than having structure and valuable content? Jordan: Yeah. So, obviously, you have to have valuable relevant content to the topic that you’re, you’re writing about. Other ways to really become relevant in the Knowledge Graph is the use of structured data. So, being able to denote very specific elements within your content. So, if this is about a person, using the schema markup to denote the person. Additionally, another great way to become referenced in the Knowledge Graph, is to have very specific forms of data on the page itself. So, for example, if you’re talking about an event having, say, a sequence, or a timeline of what happened during that event is going to be super helpful in a very, very useful reference point for that knowledge graph. Jordan: So those are a couple of tips. There’s a lot of other advice out there around Knowledge Graph, we could probably dedicate a whole week of the podcast just to how to become more relevant Knowledge Graph or answer box, but those are just a couple of the takeaways, especially for the, the writers out there or those folks, you should be asking those questions, hey, are we using structured data on these pages? How are we using structured data? And then also, do I have any data experiences on my page that allow my page to be referenced? Ben: So, just to quickly summarize, when you’re working in the media side of the media and publishing industry, you’re really optimizing for speed and that equates to using the AMP technology. When you’re on the publishing side of media and publishing, and by that, I mean you’re working on longer form content, things that are a little bit more evergreen the formatting of your content and trying to sneak into the Knowledge Graph is really the biggest ranking factor that you need to pay attention to. Ben: Okay, that wraps up this episode of the Voices of Search podcast. Thanks for listening to my conversation with Jordan Koene, Search Metric’s as CEO and lead SEO strategist. We’d love to continue this conversation with you, so if you’re interested in contacting Jordan, you can find the link to his bio in our show notes, or you can send him a tweet where his handle is JTKoene. If you have general marketing questions, or if you want to talk about this podcast, you can find my contact information in our show notes, or you can send me a tweet at Benjshap. Ben: If you’re interested in attending our custom ranking factors webinar on April 25th, head over to searchmetrics.com/webinar. If you like this podcast and you want a regular stream of SEO and content marketing insights in your podcast feed, hit the subscribe button in your podcast app and we’ll be back in your feed tomorrow morning to discuss the ranking factors impacting visibility in the finance industry. Lastly, if you’ve enjoyed this podcast and you’re feeling generous, we’d love for you to leave us a review in the Apple iTunes Store or wherever you listen to your podcasts. Okay, that’s it for today. But until next time, remember, the answers are always in the data.